The LFEditor is a TYPO3 backend extension which was developed by my colleague Stefan Galinski. It helps with editing/translating localization files making it easy and safe, with no worry that you might accidentally delete some XML tags in the process. Recently we have released version 3.0.0, which I was working on. It is fully rewritten and adapted to namespaces, Extbase and Fluid, so it is OOP oriented and it has a MVC architecture and with all the code classified by its purpose in PHP classes. This simplifies the further maintenance and implementation of new features. The following sections are describing new functionalities of LFEditor 3.0.0. There are some features that are visible only to administrators. For example, backup feature, or menu for switching between editing modes (extension, l10n and override mode). Non-admin users can’t see this menu and for them the override mode is default. This mode is default for admins and it is handy for extension authors, because it allows editing of extension localisation files directly. This is how old LFEditor was working while it was in it’s default, base, workspace modes. This mode is similar to extension mode, but only difference is that l10n directory has higher priority than extension directory. This means that if there is a copy of the language file in l10n folder (e.g. de.locallang), that copy will be edited instead of original extension file. If there is no corresponding file in l10n folder, original file will be edited. Be prepared that any changes made to the files inside the l10n folder are reverted if you update the localizations in TYPO3. The name speaks for itself. This is a default mode for non-admin users and I will write more about it in my next blog post since it is very interesting subject. Stay tuned! In TYPO3, each backend non-admin user can be restricted on a subset of languages. 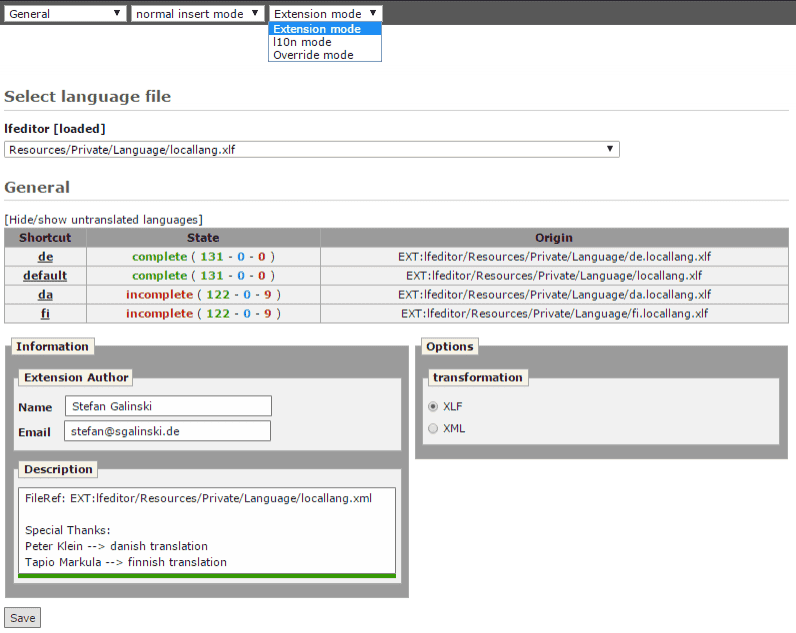 LFEditor allows backend users to edit translations in only those languages for which they have permission. 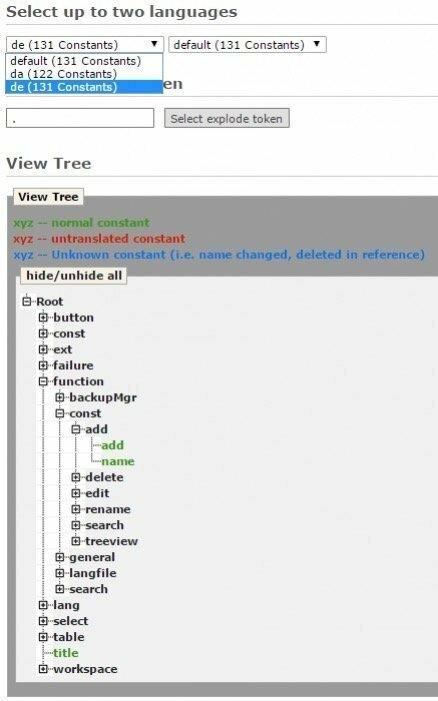 Picture below shows tree view of language constants. Also, you can notice that user can choose only between ‘default’, ‘da’ and ‘de’ languages, since the user is restricted to those. You can see the source code on our GitLab. You can also track the progress, and feel free to report bugs on Forge. Detailed description of all LFEditor features can be found in our documentation.